Alt: Why I am not doing nanowrimo. I know you’re sick of hearing writers complain about not having the time to write. I would say that it is not so much that they are not writing, in most cases, but that they want to write more. My writing word count is all over the place from one week to the next. For sure I’d like to increase the overall amount that I write, but mostly I want to have more of a rhythm. I’ve been thinking about doing nanowrimo this year but that is a 50k target in a month – more than 1k a day. I cannot guarantee that I can do that so it would be nothing but an exercise in frustration. Frustration is not what you want at the end of a writing exercise/competition. I don’t want to get to December and be more concerned with only having written 10-20k words, than just being happy that I wrote 10k words. I am never going to find those blocks of several hours, let alone whole days or weekends. OK, maybe, very occasionally. But I can’t rely on them if I am going to write my great works ;-). Actually, it is not that I am too easily distracted, I am, or at least I can be. But you don’t want to hear about excuses for why I’m not writing. I don’t want to give them either. What I want to do is explain how I’m trying to get as much writing done as I can. So, where do I find the time? This months experiment is writing every morning for 1 hour. Not my best time of day but I’ll take what I can get. No targets, except to write as much as I can. I remind myself that even if I wrote 2000 words a week that’s still 100k in a year. That’s a book! 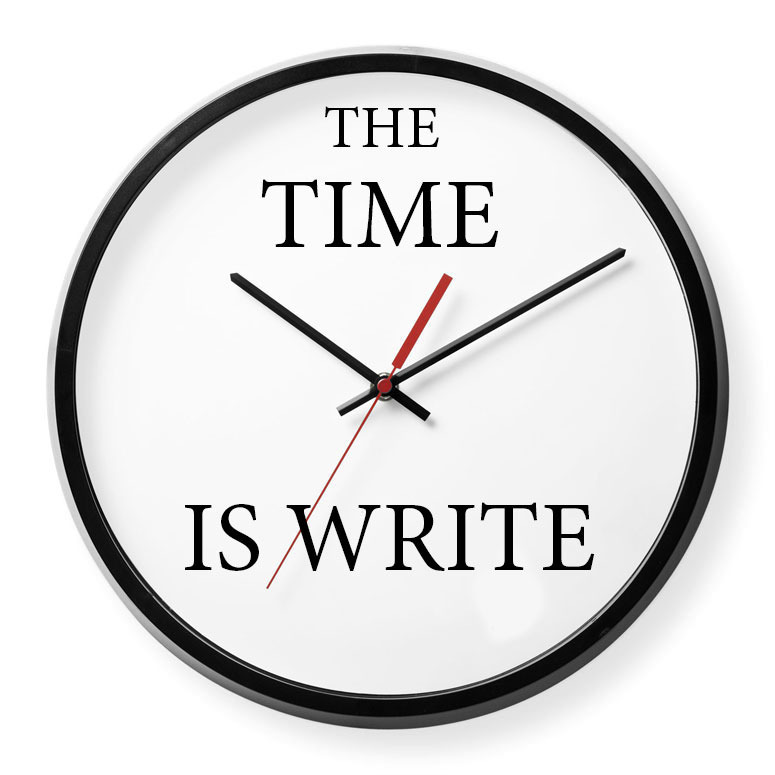 The time is write! Where do you find the time? Harry Tuttle, part enigma, part machine, mostly confused and trapped in modern life. I think. I read. I write. Science Facts to Science Fiction and Beyond. This entry was posted in Am Writing, Writing Tips and tagged Balance, Sci-fi, writing, writingtips. Bookmark the permalink.